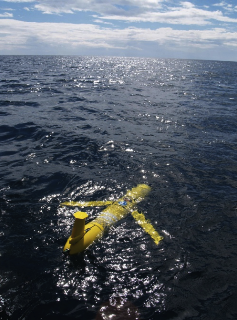 Investigators at the Bigelow Laboratory for Ocean Sciences (East Boothbay, Maine) and the U.S. Geological Survey collaborated to study ecosystem changes in the Gulf of Maine. 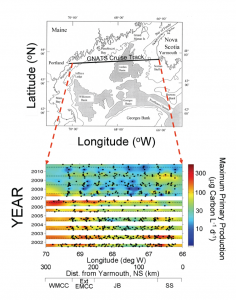 The comprehensive 12-year study of hydrographical, biological, optical, and chemical properties is part of the Gulf of Maine North Atlantic Time Series (GNATS). 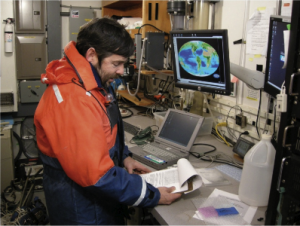 Data have been collected on multiple cruises each year since 2001 by using a portable laboratory aboard different vessels (figure 1) and occasionally a remotely controlled glider (figure 2). Data collected during these cruises, when analyzed within the context of a century of climatological and streamflow data, document changes in temperature, salinity, and coastal ocean productivity that appear to be related to recent increases in precipitation and streamflow. These results are evidence of a link between changing hydrologic conditions on land and changes in coastal ocean productivity. The study results (Balch and others, 2012) show a 5-fold decline in the growth rate of phytoplankton — the microscopic, single-celled plants that form the foundation of the marine food web and ultimately support the Gulf’s fish and lobster populations (figure 3). The decline in productivity, if sustained, would ultimately impact the food supply of commercial fish species; however, this process would not become evident for several years, because several years are required for the larvae of fish and lobsters to reach commercial size. Figure 1.Dr. William Balch in his portable laboratory used on oceanographic research vessels and other ships of opportunity (ferries, cargo ships, etc) for sample and data collection along the Gulf of Maine North Atlantic Time Series transect. Figure 2.A battery-powered, remotely controlled glider deployed seasonally since 2008 (approximately 4 times per year) along the Gulf of Maine North Atlantic Time Series transect to better understand the vertical distribution of optical and hydrographic properties. The Gulf of Maine has received extraordinary amounts of runoff from land since 2005 (the second half of the 12-year GNATS time series), associated with well above average precipitation. For example, 4 of the 8 years with the highest precipitation in Gardiner, Maine in more than a century occurred from 2005 through 2009. Runoff in the Penobscot River Basin was greater in 2005 than in any other calendar year since records began in 1903. In addition, 2006, 2008, 2009, and 2010 were all among the 20 years with the highest runoff values; runoff in 2007 was also well above average. Increased river discharge appears to be preventing deep, North Atlantic water — which carries silicate and other nutrients essential for phytoplankton growth — from entering the Gulf of Maine through the Northeast Channel, causing significant changes in the Gulf’s biogeochemistry. At the same time, greater runoff from rivers has led to an increase in the amount of detritus and colored dissolved organic matter in the water, reducing the amount of light available for phytoplankton photosynthesis and growth. 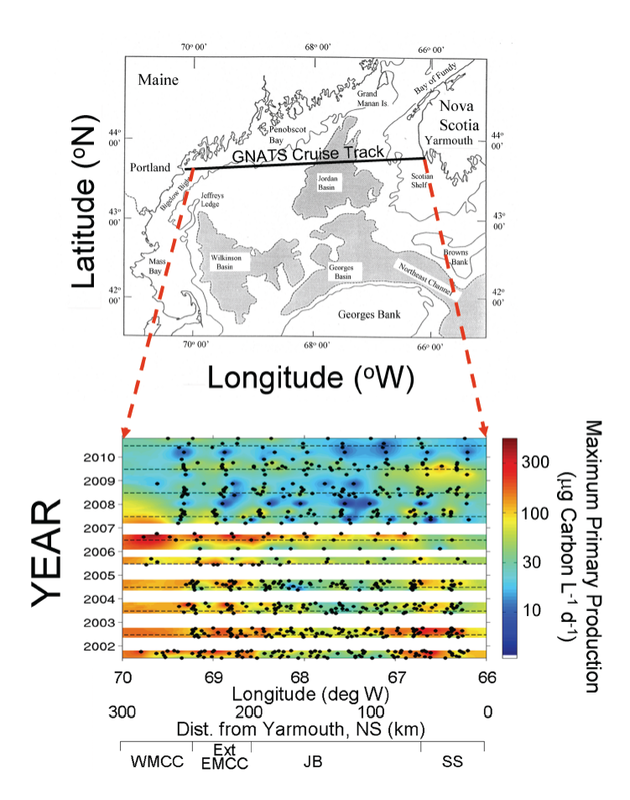 Figure 3.Top panel:Map showing the Gulf of Maine and the location of the Gulf of Maine North Atlantic Time Series transect between Yarmouth, Nova Scotia and Portland, Maine.Bottom panel: Plot showing changes in maximum primary production over time (vertical [y] axis is in years from 2001 to 2010) and space (horizontal [x] axis, shows positions along the transect, in degrees west longitude and distance in kilometers from Yarmouth, Nova Scotia). Dashed horizontal lines signify the summer solstice of each year. Colors, which represent primary production rates, are keyed to the color bar at the right. Cool, blue colors indicate low rates; warm, red colors represent high rates. (Note that the color bar scale is logarithmic, not linear, and covers rates of 3 to 300 micrograms carbon per liter per day — a factor of two orders of magnitude or 100x). Water masses along the transect are indicated at the bottom of the figure: Western Maine Coastal Current (WMCC), Extension of the Eastern Maine Coastal Current (Ext EMCC), Jordan Basin (JB), and Scotian Shelf Water (SS). Temperature and salinity data were compared to measurements made along the same transect beginning in 1978 by other scientists, including Dr. Charles Yentsch, founding director of Bigelow Laboratory. The results show statistically significant increases in surface temperature in the Gulf and decreases in salinity. The increase in sea surface temperature (0.018°C per yr) is considered a moderate rate of warming and is consistent with global increases in ocean temperature reported by other researchers. The decrease in salinity (–0.0087 PSS per yr) is greater than changes observed by others farther offshore in the Atlantic Ocean, presumably as a result of freshwater entering the Gulf fro river sources. Such long-term salinity decreases can be caused by a number of climatological factors, including increases in precipitation and runoff and the melting of the polar ice cap. Balch, W.M., Drapeau, D.T., Bowler, B.C., and Huntington, T.G., 2012, Step-changes in the physical, chemical and biological characteristics of the Gulf of Maine, as documented by the GNATS Time Series: Marine Ecology Progress Series, v. 450, p. 11-35.